The House & other Arctic musings: Avalanche! Saturday afternoon I headed out to the St George Society Cliffs to check on the Gyrfalcons. It was a beautiful sunny day, but a little breezy. I wasn't too concerned that I couldn't see any birds. I assumed that one bird was on the nest, tucked back in the aerie where I couldn't see, and that the other was off hunting. I'm amazed of how good a spot that these birds have chosen. The spot on the cliff is in a large hollow where some time in the past a great part of the cliff face fell into the ocean. The little cave of the actual nest is even located under a larger overhang, further protecting them from the elements. The nest was well whitewashed, as were the half dozen or so prominent perches used by the birds. I hung around for about an hour, walking to the base of the cliff to see if there were any prey remains to be found below, there wasn't. Two things always surprise me when I come out here. One is how the sheer size of the cliffs messes up my perspective. I always think I park closer to the cliffs than I do and it startles me when I start walking and don't seem to close the distance. The other is that I always think I'm going to get creamed by a rock fall when I'm under there, close to the base. 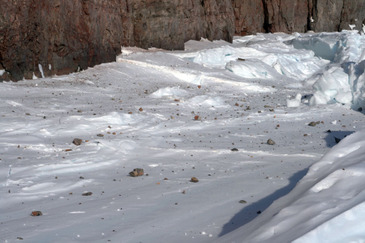 Although the snowmobile seems close to the cliff in this picture, it is probably 75 metres from the face. Now while that might seem like a irrational fear it's not. 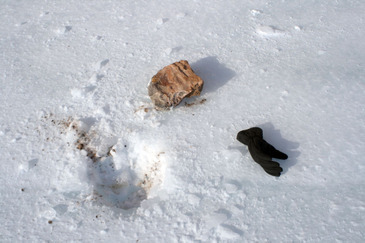 There are always a lot of rocks on the ice that have fallen, and often when I'm out there in the spring, when everything is quiet, I can hear the "click clack clack" as a rock falls away somewhere along the face. From 600 feet, even a small rock would sting. 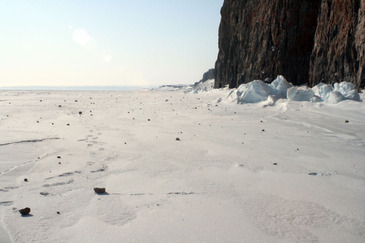 The cliffs were surprisingly quiet, no ravens at play, no Gyrfalcons, the only sound was the groaning of the ice as it shifted up or down with the tide. I went back to the snowmobile, laid back on the seat, and waited. It was gloriously warm, for fortuitously I had parked directly into the wind, and the windshield actually did what it was suppose to do (does anyone else find these things far too short? What is the point?) and I basked in the sun. I hung around for an hour or so, tried to find a place where I might be able to better see inside the nest, and then headed back to town, pausing to pick up a wayward fellow blogger. Okay, not really wayward, Darcy was out for a walk, photographing the cliffs. I was troubled that I didn't see any birds, and headed out again Sunday for the aerie. Perhaps troubled is the wrong word, I would just be more comfortable to see them, and know that the aerie was alright. Sunday was another gorgeous day, even though it was a little windier than the day before, and I fairly sped out to the spot to see. Once again, I could see no birds, and as I waited I ran possibilities through my head. Had my trip out the other day disturbed the beginnings of their nesting season? The bird on perch had seemed very nonplussed at Travis' and my presence. Had I only imagined seeing the top of the second birds head on the nest and was the bird I saw the sole bird vainly waiting the return of its mate? Or am I just not seeing the bird on the nest, while the other is away foraging (the aerie is high enough up that unless the bird was standing on the nest, or at the edge you wouldn't be able to see it from below)? What ever the case I spent close to two hours waiting, in vain. Once again the cliffs, for the first while, were strangely quiet, but then I heard the calling of a Raven from somewhere high on the cliff face, and then a second in answer. They were making calls (each distinct) that I had not heard before and then when the second bird appeared the first left its perch and the two soared high along the top of the cliffs, calling constantly. They left for awhile but kept returning all the time I waited. 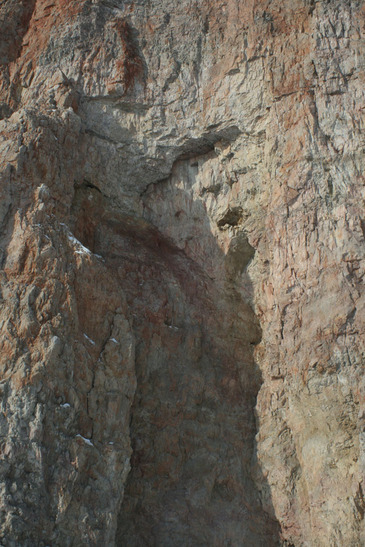 Once again I took a walk to the cliff face, but this time I was startled to see that a fairly large rock fall had occurred since my last visit. 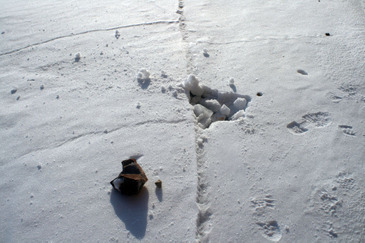 Judging by the distinct tracks in the snow it didn't occur long before my return, remember it was blowing a good wind. Some of the rocks had bounced and rolled and ended up perhaps forty or fifty feet from the cliff, and there were a lot of them lying around. 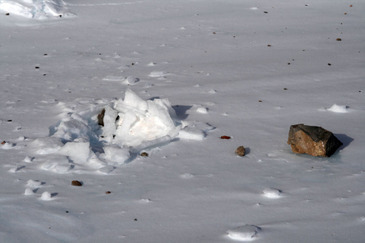 Some had smashed or even cratered the new ice formed from upwelling tidal water. 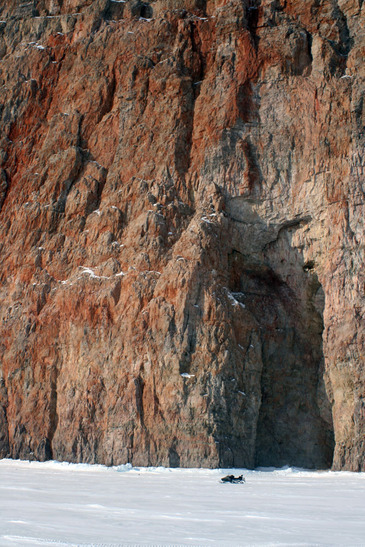 Here are some pictures of the rock fall. Some of the rocks, well away (perhaps 20 metres) from the cliff face. Another view, you can see some of the bounce marks and trails in the snow. Follow the bouncing ball, er rock. 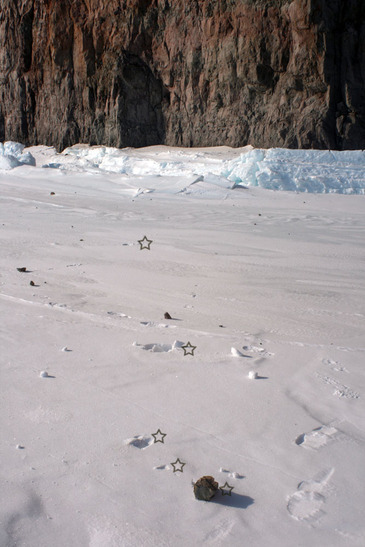 My footprints are visible for scale. Another impact, with my glove for scale. Hard to see in this picture, but this is a perfect little crater, about 18 inches across. 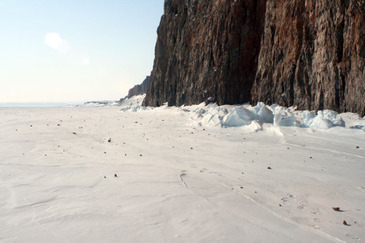 Some of the rock behind the tidal pressure ridges.